If I read one more recipe that begins with saying that the recipe is the perfect way to use up the overload of summer tomatoes, I’m going to scream. Okay, in deference to my neighbors, I won’t. But to me, there is no such thing as having too many tomatoes. That’s just crazy-talk. We don’t have the overload of great tomatoes in Paris that folks have elsewhere, like when I was in Agen last year and the markets were full of them, or in San Francisco or New York, where market tables are heaped with them in all colors, shapes, and sizes. So I’m over-the-moon when I find good tomatoes and use them carefully because they’re so precious. I’m not normally a fan of hot tomato soup, but last year I was in New York City and a restaurant served little cups of it with grilled cheese sandwiches, and I was hooked. Jeez, what have I been missing out on for the past fifty-four years? Still, I didn’t serve this with grilled cheese sandwiches because I was with a friend’s French mother, and the idea of eating soup with a sandwich – well, it’s just not done. At a meal, you eat soup first, then a sandwich. But she was astonished that I ate – get this – soup along with bread and cheese, at the same time, for lunch or dinner. I never realized what a maverick I was. Or more likely, how gauche I was all these years. This recipe is from The Bonne Femme Cookbook, by Wini Moranville. When he saw it, Romain told me that a “bonne” femme means a woman who is “easy.” I don’t think that’s what the author had in mind when writing the book, but I will say, this recipe was easy to make and really an ideal way to coax flavor out of tomatoes. 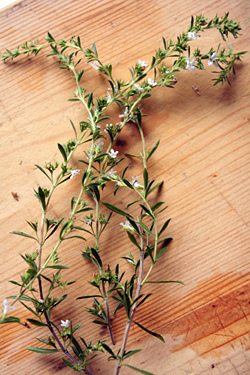 I used fresh savory, which is a lesser-known herb, because I found a nice bunch of it on a visit to the countryside. 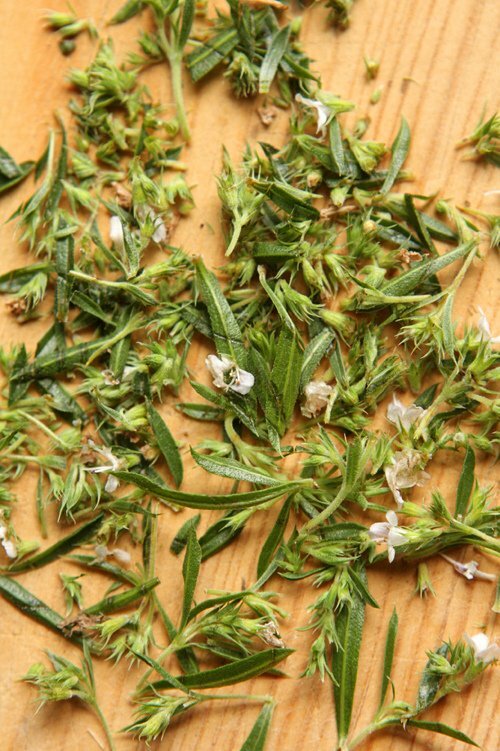 It’s smell is reminiscent of fresh thyme, but it’s less-aggressive and a bit rounder in flavor. Plus I like saying the name. No one has accused me of being “easy” (so I guess I’m not a bon homme), I gave it a decidedly non-French touch with a heap of corn salsa in the middle. I envisioned a relish-like condiment that was slightly pickled, to conserve the flavor and texture of the fresh corn without cooking it to a fare-thee-well. And I wanted it to mingle nicely with the soup. I wasn’t sure if it would go well. But in the end, it was a just fine. It’s always hard to tell people how much chopped chiles to add because each one, and variety, is seemingly different. In fact, I overdid the chiles, using what are called Moroccan chiles here in Paris, which range from mild-to-spicy, depending on each pepper. Fortunately I didn’t get in trouble for spicing things up around here. But I was careful not to serve the soup with any cheese. That said, if you want to serve it with some crumbled queso fresco or a bit of crème fraîche, well, I won’t tell. Adapted from The Bonne Femme Cookbook by Wini MoranvilleThis soup, while intended to be served warm, tasted delicious cold as well. Winnie recommends using low-sodium chicken stock to enrich the soup but I used water, which was just fine. If you have a lot of tomatoes on hand, I would recommend making a big pot of this soup and freezing it for a few months.I didn’t remove they skins but if you want, you can slip them off easily after they’re roasted. But they blitzed away to nothing in the blender. For the salsa, I used chipotle chili powder because I like the smokiness. You’ll have some leftover salsa, which makes a nice dip for tortilla chips.This soup serves four, although there won’t be enough for seconds. It can easily be doubled, tripled, or quadrupled. 2. Cut the tomatoes in half horizontally and squeeze out the seeds. 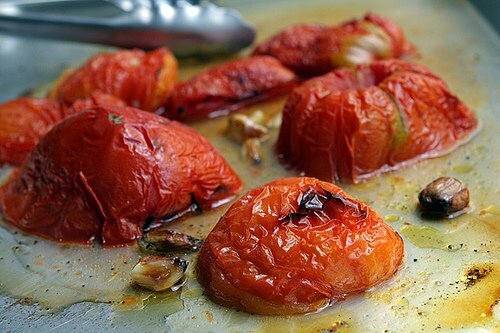 Toss the tomatoes with the olive oil and garlic on a baking sheet, seasoning them with salt and pepper. Turn the tomatoes so they are all cut side down, and bake for 20 to 30 minutes, until the tomatoes are completely soft and beginning to char on the bottoms. 4. 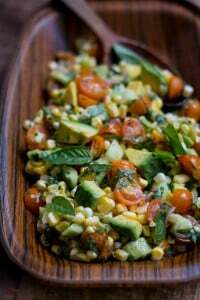 Make the corn salsa by warming the corn kernels in a skillet with the olive oil until slightly soft, about 2 minutes. (If you have a grill, you can char them there instead.) 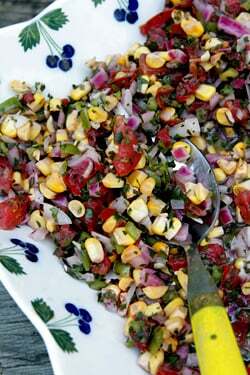 Scrape the kernels into a bowl and mix in the diced tomatoes, onions and peppers, as well as the chopped chile, parsley, chili powder, the juice of 1 lime, and some salt. Stir together and taste, adding additional lime juice and salt if desired. 5. 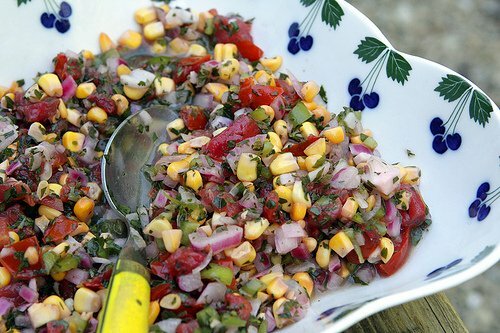 Warm the soup in a saucepan and divide into bowl, adding a generous heap of the corn salsa in the center. Note that you want to warm the soup pretty well so that the heap of salsa doesn’t cool it down. I’m with you – I could never have too many tomatoes! yum! quick question, do you remove the skins after roasting or do they puree ok? So honored you used my recipe. Thanks! And indeed, make extra batches and freeze the soup! I freeze it in two-serving containers and bring it out in autumn with—yes—a grilled cheese sandwich. Thanks again, David. 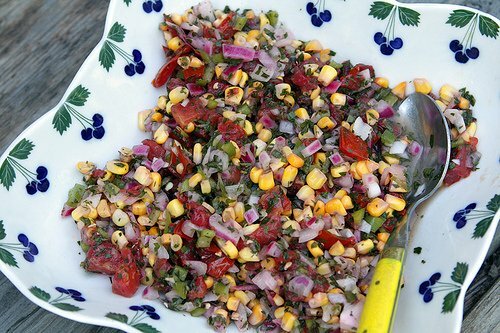 I’m particularly attracted to the beautiful corn salsa. In the text you said you wanted it slightly pickled, but I don’t see anything in the recipe that would do that. Am I missing something? Regardless, it’s corn season here and this is on my agenda for this weekend. Perfect timing on your part so thanks! I’ve been wondering what to do with my recently acquired savoury plant. Thanks! I love that corn salsa. 1000% with you on the “too-many-tomatoes” front; if anything, my summers are never filled with enough tomatoes, even though I always seem to have them around. I liked how you mentioned this could be served hot or cold; I think a chilled tomato soup with a spoonful of spicy corn salsa would be freaking incredible on a late summer day. 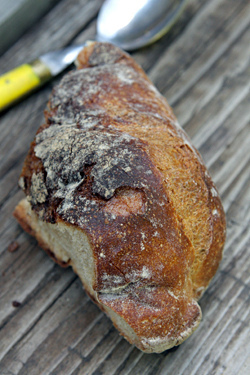 Any chance that the luscious bread in photo is homemade, and that you would be able to share the recipe? Love your blog and books! I agree that you can never have too many tomatoes (seems like everyone else does too). There’s nothing that tastes as heavenly as a sun-ripened tomato, a drizzle of olive oil and some sel de mer for lunch. If there are a lot of tomatoes in the market (you can sometimes get a huge bag for a euro) I make tomato sauce and freeze it for the winter when they are watery and tasteless. Can anyone recommend a farmer’s market or shop selling top-quality fresh corn in Paris? I just returned from vacation back ‘home’ in New England where one of the sweetest summer pleasures is farm fresh, picked-that-morning, corn on the cob. After 13 years in Paris, I still haven’t found a source that comes close to those heavenly golden ears. You know the kind — with the small, sweet crunchy kernels. Do they exist in Paris? What’s on the bread David? Every time I have made American style grilled cheese sandwiches for anyone in England they have loved them. Maybe it would be the same over in France! Today I had a delicious gazpacho in a local restaurant served with dried black olives on top – they were baked in the oven. They were served alongside ribbons of cucumber as a garnish. Really nice and chewy in a good way. Yes, can’t have too many tomatoes in the summertime. As summer turns into fall this recipe sounds perfect for fresh summer produce (thankfully still abundant in NYC) into comforting fall grub. 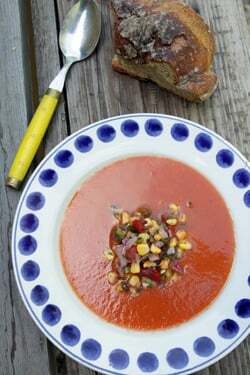 Love the idea of corn salsa with the tomato soup. 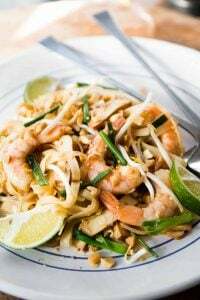 Wini: The recipe is great – super easy, er, I mean… simple, and it tasted great! Your book is terrific. Molly: I rarely make bread because it’s so easy to get good bread in Paris and bakeries have the super-hot ovens and starters and so forth, to get it just right. This is from a bakery just outside of Paris that someone brought me. 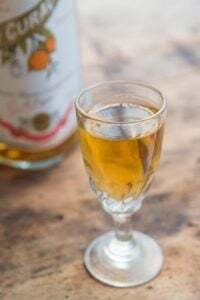 ClaireD: I originally tried it with some white vinegar but thought the taste was too harsh and too-pickled tasting, so used all lime juice instead. “Overload of tomatoes” is as ridiculous-sounding to me as “leftover coffee”. Where is this tomato overload, because I will go there! And where can I get some of this fabled leftover coffee to make coffee ice cubes? Grilled cheese sandwiches and tomato soup is a must have, made in Heaven, MATCH. Yum. I’m going to make your soup, David. Thank you. My 26 tomato plants are showing signs of ripening all at once this year (been an unusually cool August so far, which has delayed things a bit). This recipe is exactly what I needed–bonus that it can freeze! Beautiful soup, so rich and red/Lucky me, so wonderfully fed…. Yes! I will be freezing some. We are having a bit of a casual back-to-school party here tonight, and this salsa might just show up. The soup looks wonderful but I would kill for a bite of that bread. We just can’t get bread like that in SoCal, well, certainly not in Palm Springs. I’m laughing at the comments about leftover coffee and soup. Those kind of leftovers are right up there with leftover wine. Great photos as usual, David. Thanks for being in Paris for those of us who can’t. Katy, I particularly agree on the silliness of the concept of leftover wine! Lovely soup, and I adore the corn salsa. How perfect! Love the combination. This is a must try. Our markets in Los Angles are pilled high with wonderful tomoatoes. Off I go! Oh, and the corn is great also. I still can’t seem to get over the tomato sauce flavor of tomato soups, except for one recipe which added some pesto to it. Or maybe it’s the soup with croutons from a packet my mother stuffed us with as kids (not a cook, my mom)! The salsa is the kind of interesting addition I’ve been looking for. Thank you David! This is the recipe I was looking for.We have fresh delicious tomatoes- all year round in Mexico City and Cuernavaca where we live. Lucky us! Our favorite soup is roasted tomato soup, And the salsa! I like your blog, you have a great sense of humor! We ADORE living in Paris……oh la la! we stayed in a beautiful apartment one month across the street from the back of Notre Dam with a view to the Seine River, and lived like Parisians. We have extended family in Paris (cousins), and invited them over all the time for dinner. Wonderful, lovely, easy soup. I had selected a few tomatoes this morning with a promise to do something with them before end of day; then this well-timed post appeared. My blender didn’t quite take care of the peels completely, so I wound up straining the soup. But even that’s easier than peeling tomatoes. Can’t wait for the farmers market tomorrow and more tomatoes! Luv the recipe. For cheese, you could add a few of those tiny round mozzarella balls – burrata? to the salza. Might be interesting. Dave……….Thanks for the lead to Robert !! Heirloom Tomato Tartine…………..Fabulous. Now onto your tomato soup……..The tomatos in NYC Greenmarkets are exceptional… !! This soup looks delicious! 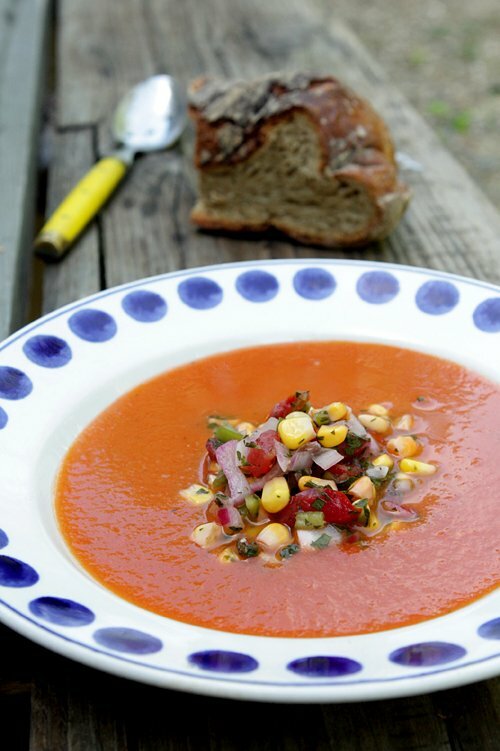 I love the corn salsa on top, what a fun twist on a classic soup! Sorry for being a pest, but how long will the corn salsa keep? I love that cookbook! I’ve taken it out of the library twice and renew it as long as they let me. The Basque Chicken recipe is to die for along with Chicken with Morels. I’ll have to try the tomato soup soon. and you might enjoy it. Let’s add leftover chocolate to that list. Gigi–thanks for clarifying. 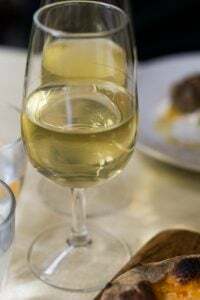 Yes “bonne femme” means the “good wife” but in the context of food, cuisine de bonne femme is uncomplicated home cooking. But I’m good with “easy,” too–as that’s my goal (in the context of food, anyway). I love tomato soup, love the addition of corn salsa. I would love it with some grilled cheese plz! When I went to school I was taught that “bonne femme” meant “housewife”. Maybe French housewives have a racier life than I realised! You should have seen the time I had some bread and cheese as a snack, followed by some chocolate at a French friends house. They were appalled. Cheese and chocolate? Bread, cheese and or chocolate? No no!! Great way to use up all those tomatoes and that runaway thyme from the garden — thanks! Surprisingly enough, the saveol tomatoes I’ve tasted were better than the (admittedly low) average. What is grilled cheese sandwich-American way? Is this like a croque monsieur without ham? (I’m French and from everybody’s comments it looks like i should definitely to try this with the tomato soup), thanks for your insights! Greetings from Portland, Oregon. I saw your recipe this morning, went to the Beaverton Farmer’s Market and picked up all the fresh ingredients, including heirloom tomatoes at 99 cents a pound! Came home and made the soup and salsa. It is just wonderful. We are having sort of a rainy cool day here so it was the perfect antidote. David, Thank you for another gorgeous post which brightens up a rainy day in Paris. Will try this asap! Vicki: 99 cents a pound? I’m jealous! 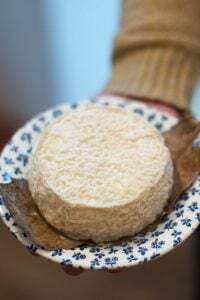 Lalla: I’ve not had a Savéol or hot-house tomato that I’ve liked, although I know people buy them and they are popular in Paris – especially in the summer. Wini: I think maybe we’ve come up with an idea for your next book – how much fun with that research be?! 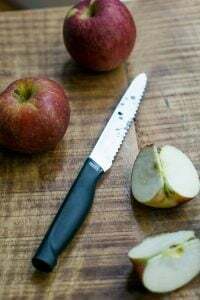 I just had the same debate with myself last night before making dinner. . .my mother had dropped off 6 perfectly ripe tomatoes from her garden, and although i had a new recipe to try with them, i wavered. Would the recipe be good? Good enough to use up all 6 gorgeous tomatoes? Well luckily i took the risk, and i’m commenting to recommend the recipe to you! One of smitten kitchen Deb’s most recent recipes is tomatoes stuffed with rice, and if you haven’t made something similar before, you must try it! It was absolutely delicious. I worried that the bright, unique flavor of the homegrown tomatoes would be lost in the rice and the baking, but to the contrary, the intensely tomato-y rice was certainly on of the best things i’ve tasted all summer. Try them! Oh and by the way, i wanted to comment on your currant.jam post as well. 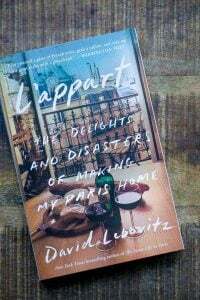 it reminded me of an episode of the splendid table, lynne rossetto kasper, that i think i heard last summer. Someone called in and said they had an abundance of some kind of berry, and asked for ideas to use them up. She kind of suggested jam as one possibility, but in doing so she said “no one eats jellies and jams anymore, but. . .” I was astonished! I thought, i can’t possibly be unusual in my love for confiture, can i? Well, whether i am or not, i’m glad to be in good company with you, and i love that you post jam and jelly recipes regularly! With fresh ingredients from the farmer’s market, this was delightful! Thanks! 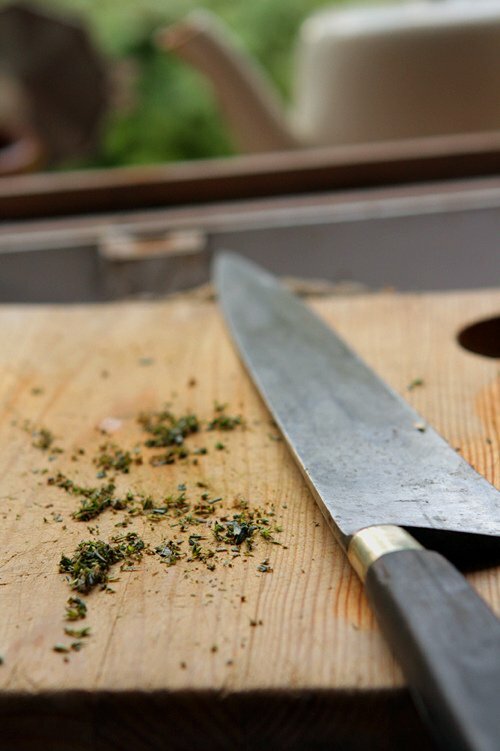 Did you see the NYTimes story on the physical stress of being a chef? I tried the recipe last night and it was delicious but..I was using a new oven so didn’t leave enough time to pre-heat before I put the tomatoes in (so the oven was only at 300 deg at the start) and then I used a pan with 2″ sides although a lot of surface area. Anyways, the tomatoes gave off a lot of water that didn’t evaporate so the bottoms never started to char (something I imagine adds depth to the flavor). Any idea which of my inaccuracies caused the liquid to collect in the bottom of the pan instead of evaporating? I think 100º is a pretty big variance in temperature and it’s likely the tomatoes started cooking, but did so slowly, allowing the juices to run out rather than “sear” and caramelize a bit as mine did. 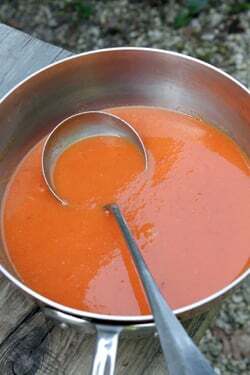 Tomatoes can also vary; mine were pretty meaty and firm, and some juices ran out but thickened nicely, and I added them to the soup mixture. Just made this soup: beautiful on a rainy summer day after wisdom tooth surgery. I made it sans salsa, it was wonderful with a sprinkling of grated parmesan. Can’t wait to try this with crusty sourdough in the fall. Thanks! 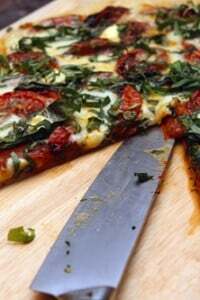 I had lots of tomatoes and herbs from my garden and decided to try this recipe. It was a huge hit. Even my kids enjoyed it. Given that it has been hot here, we ate it as a chilled soup. My tomatoes were not small so they took significantly longer to roast than the recipe recommended. I did not peel the tomatoes before adding them to the soup and used half chicken broth and half water. I made it in a deep pot so that I could use a hand blender to puree the soup and not splatter everywhere. Thanks for the great summer recipe! 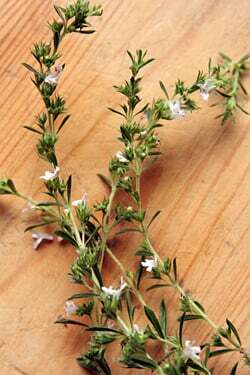 Is this summer savory or winter savory? It looks like winter savory. I happen to have a large winter savory plant right now, but it is hard to take any of it because the bumblebees are loving it so much. I normally use savory for roast lamb (I prefer it to rosemary or mint). I stuff the lamb with sprigs of winter savory, dried tomatoes and split cloves of garlic and salt and pepper the outside. It’s great! I also used to have a french rabbit recipe that called for savory. Needless to say, these two recipes are more cold weather friendly (who wants to cook for any length of time when it’s hot?). The soup on the other hand seems much more summer friendly. So now I have a use for winter savory during the summer. . .
I’m thinking this soup would be yummy with a fresh cheese quesadillas, especially if made with corn tortillas. 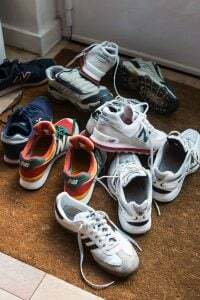 **Looks around at empty larder** Must go shopping! This recipe is so amazing! Simple and perfect!! The salsa was even good as a left over! 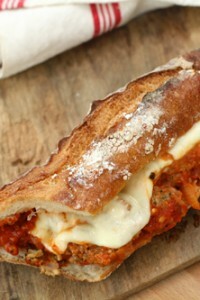 I made this for dinner tonight with cheese toast, and it was heavenly! Someone left a bag of garden tomatoes on my porch last night-I still have no idea who, but glad I could put them to good use! Made this tonite — wow! I used a bit too much oil for roasting the tomatoes, but put that into the salsa. Don’t know whether that added to the depth and explosion of flavors or not, but this recipe is going into the summer rotation. Delicious.